Working from a live model there is no predicting if your efforts will be successful - there are simply too many variables involved in the process. However, ones chances of a good outcome are greatly enhanced when the model displays a level of proficiency that challenges your own. August 9th marked the fourth anniversary of this blog. Counting the two years I kept a private art diary that totals six years of introspection regarding the figure. From the beginning, the point was to verbalize my working methods and intentions with the hope of making at least some incremental progress. For the last year or so my desire to scrutinize the intricacies of live figurative work has been waining. I'm more interested in just looking and reacting. It follows that the content of this blog will evolve to reflect this new reality. 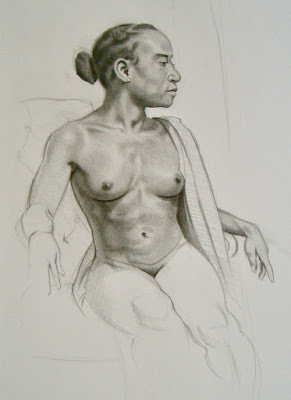 A large percentage of the drawings appearing on this blog are from the local figure drawing group I have attended for the last seven years. Each session includes some warm ups followed by progressively longer poses with thirty minutes being the longest. Undoubtedly, some attendees would prefer more extended poses while others find fifteen minutes sufficient. A half hour has proven a good compromise. A thirty minute time limit forces one to work deliberately and with an appropriate sense of urgency. It is important to reinforce this working cadence. One can easily fall into bad habits given too much time.